Part of the fun in reviewing Julio Cortázar’s fantastic From the Observatory, which, among other things, intertwines the migration of eels with meditations on Jai Singh’s 18th century Jaipur observatory, was trying think out of the box in terms of writing the review itself. The book includes grainy black and white photos of the observatory taken by Cortázar (and “transformed” later by Antonio Gálvez in Paris), and Andrew asked if I would take some of my own grainy black and white photos. I ended up including a shot of some unusual light fixtures that seemed in line with imagery throughout the book (circular, somewhat bulbous, generally strange) as well as a shot of C.M. Ruiz’s work, which both captured the feeling of inward revolution that propels the story and seemed delightfully eel-y. 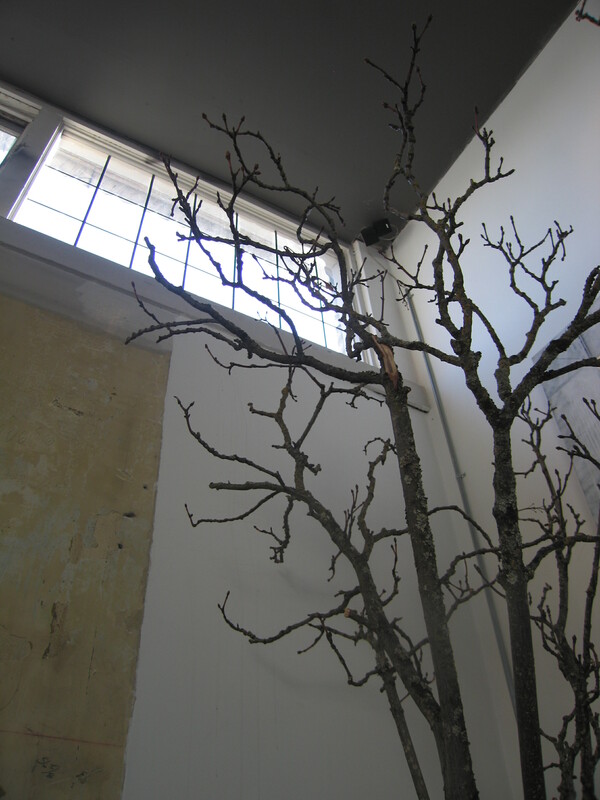 Tree branches at Arabica, where the other photos are taken. I liked this one, but it didn’t end up seeming as relevant.